The Great Online Shopping Festival is back for its second year and just about everyone is excited. While most ecommerce companies spent the wee hours of 11th December crafting the right deals and discounts, even consumers have spent burning the midnight oil hunting for those awesome deals. Google’s home page for GOSF, gosf.in however has surprisingly crashed several times and even shows the wrong time on the countdown meter. Clearly some things haven’t gone according to plan. Irrespective of these technical difficulties, GOSF is on in full swing and we are sure the numbers will do the talking for Google and ecommerce in general. However, what does GOSF have in store for the consumer? Is India’s Cyber Monday truly it’s biggest Shopping festival? Which categories are being sold most and how much are the typical discounts? This post addresses all about this and more. The key to the success of any Shopping Festival, be it online or offline is the number of participants. GOSF in 2012 had 70 odd partners while GOSF 2013 has over 230 partners. The best part of-course is unlike last year all the top ecommerce sites have officially partnered with Google this year for the GOSF 2013. However how much are they into the shopping festival? 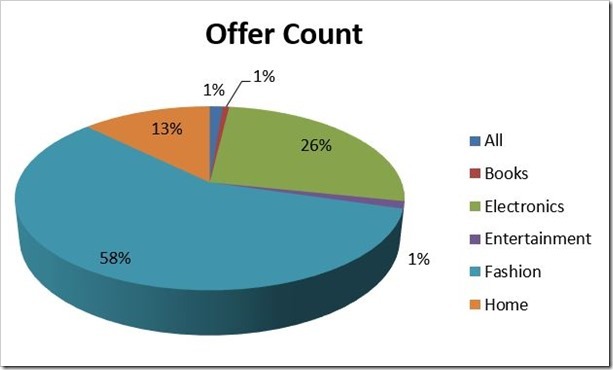 How have the top websites responded to the GOSF in providing offers? 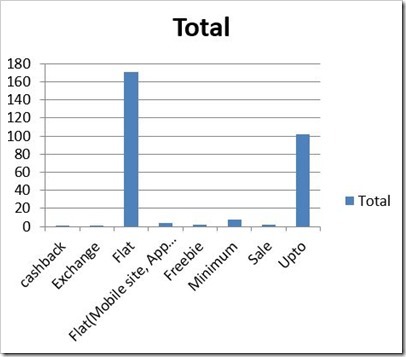 We have analyzed over 40 stores and put up the total number of Offers provided by them for the GOSF. These include category wide offers and not just individual deals on single SKUS. Clearly Yebhi, eBay and Snapdeal have gone all in for the GOSF offering over 30 discounts on different categories. Yebhi have offers across different categories including every Fashion item as well as mobiles and electronics (which it launched only recently). While most stores have provided sitewide discounts for GOSF, few have focused on key categories. 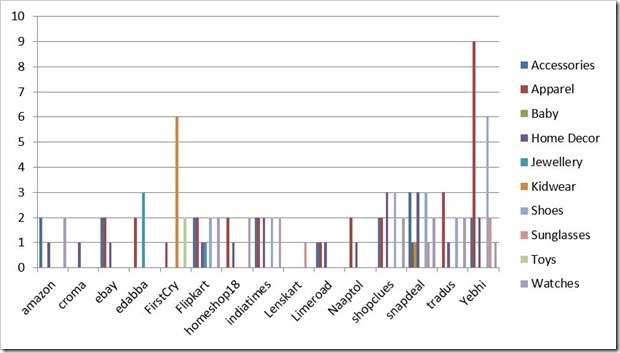 A look at the graph below will indicate the focus area of most ecommerce stores for GOSF this year. 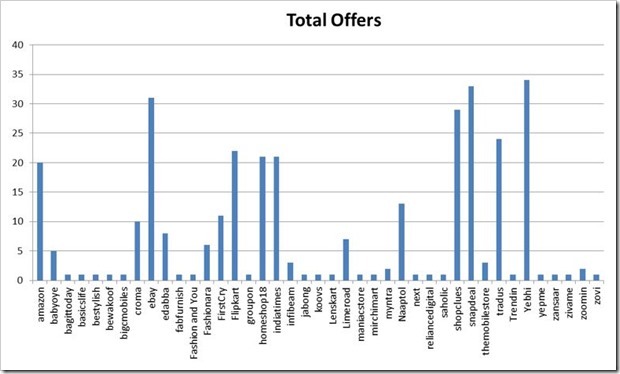 Analysing over 300 offers across 40+ stores we find that the largest area of focus has been Fashion in GOSF this year. Fashion offers make up 58% of all offers while Electronics is a distant second with only 26% share. Clearly ecommerce stores have found it more lucrative to provide offers and discounts on Fashion items due to higher margins. With over 182 offers of the total 318 analyzed, Fashion was the clear winner. But within Fashion, most websites preferred different items to each other. Here’s a look at the various offers in Fashion across different sites. Clearly, Apparels have been the choice of most ecommerce sites when it comes to Fashion offers. Accessories and Jewellery too are close seconds. Seasoned ecommerce buyers are familiar with most of the offer types available across ecommerce sites. While typically ecommerce sites have favored providing direct discounts or flat discounts. Sites also prefer the use of varying discounts of up to a certain value. GOSF 2013 too isn’t different with most participating websites offering flat discounts across categories. Few websites have been creative in offering Cash backs or Freebies however we are sure most novice users would prefer Flat discounts. So you have seen the ads and you have finally fallen for the hype and chosen to take part in GOSF frenzy. Would it be worth your while? How much have most sites offered in terms of discount? 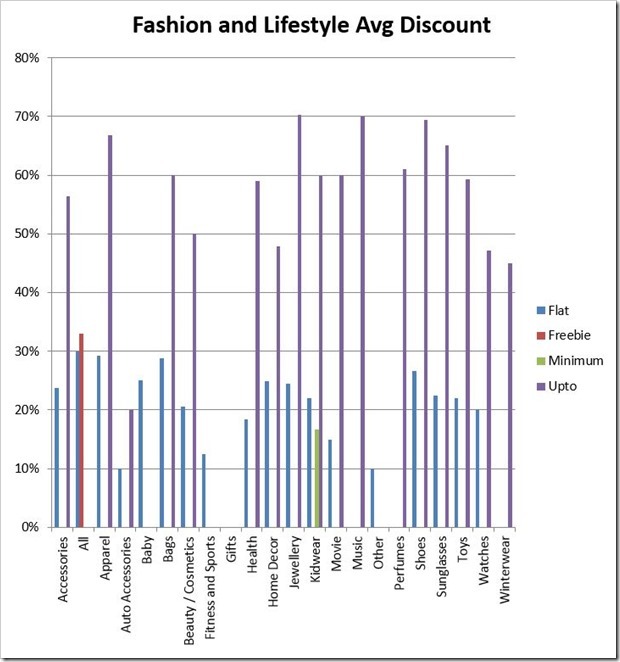 A look at the average discounts in Fashion, Lifestyle and Electronics below will answer most of your doubts. Clearly discounts are huge for Jewellery, Shoes and Music. These should remain your top preference when buying on GOSF. While discounts in Fashion have gone up to 70% for these categories, other categories too haven’t disappointed. Perhaps the only qualm folks might have is that offer’s aren’t attractive enough for Auto accessories and Gift items. These however aren’t very popular categories in general. If you wish to buy a headphone or keyboard etc., GOSF is the perfect time with discounts up to 50%. Accessories are the clear winner in the GOSF 2013 offers while Mobiles seem to be regular affair. 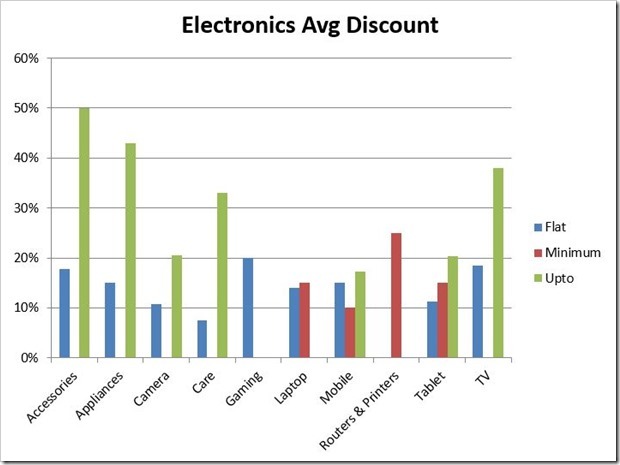 The discount provided by most stores is varying in the Electronics space. Only few have bit the bullet and provided Flat discounts on products across categories. Most have strayed away from making such site wide discounts. A big highlight this year is the sheer discounts offered on Televisions. With discounts as high as 40%, there is no reason for you not to upgrade to that HD LCD this new year. GOSF 2013 seems a mixed bag in general. While some participating sites have provided offers across sites, most have strayed away, focusing on key Categories. Fashion is the clear winner in GOSF 2013, with massive discounts on accessories, Jewellery and Shoes. Electronics has shown some promise but mostly have focused on tried and tested discounts for mobiles, tablets and computers. Only electronic accessories and Television offers seem enticing enough this year. While Yebhi have adopted GOSF whole heartedly, few major ecommerce sites have offered as many offers. Hope GOSF provides each one of you with something delightful. Happy Shopping! If you would like a snapshot of all GOSF deals visit MySmartPrice’s GOSF page here. GOSF 2014: 7 Things Shoppers Should Avoid!